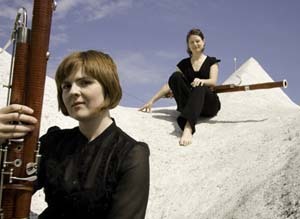 Bassoonists Rachael Elliott (Clogs) and Lynn Hileman (founder of AV Space) perform avant-garde chamber music for 2 bassoons, with music by Dutch composers Louis Andriessen and Chiel Meijering, Russian Sofia Gubaidulina and American Michael Daugherty, along with two short solo pieces by American composers Bobby McFerrin and Dennis DeSantis. "Listen to it. I don't know; I will never know whether it is a diamond or a coin"
The Hidden Noise Ensemble is an Atlanta musical collective concerned with electric music and multimedia work. Our mission is to inhabit that frontier where found sound, electronics, and live performance idioms all intersect. We welcome all friends of sonic and spatial exploration!